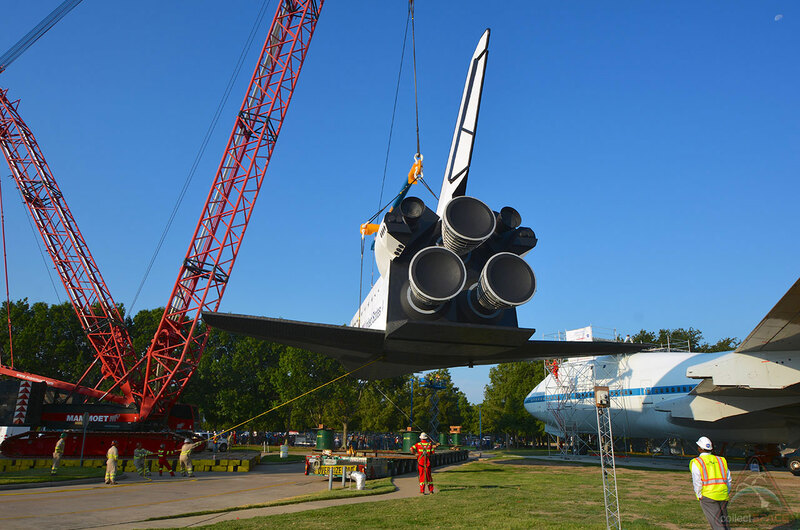 — It was not quite a blast off, but a full-size, replica space shuttle rose into the morning sky over Houston on Thursday (Aug. 14), to be mounted on top of a historic NASA jumbo jet. The brief, crane-enabled flight of the mock space shuttle "Independence" was the latest milestone in Space Center Houston's plans for a $12 million attraction with the orbiter and aircraft stack as its unique centerpiece. Once it opens in 2015, visitors will tour inside both the Independence and the Shuttle Carrier Aircraft (SCA), the modified Boeing 747 that NASA used for 30 years to ferry the iconic black-and-white winged spacecraft across the country. "We gather here today to celebrate one more chapter in an ongoing story," said Richard Allen, Space Center Houston president and CEO, during a ceremony that preceded the space shuttle's rise. "When complete, this one-of-a-kind, eight-story-tall international landmark will be the only place in the world where visitors can see the historic Boeing 747 Shuttle Carrier Aircraft and full scale space shuttle replica in this configuration." 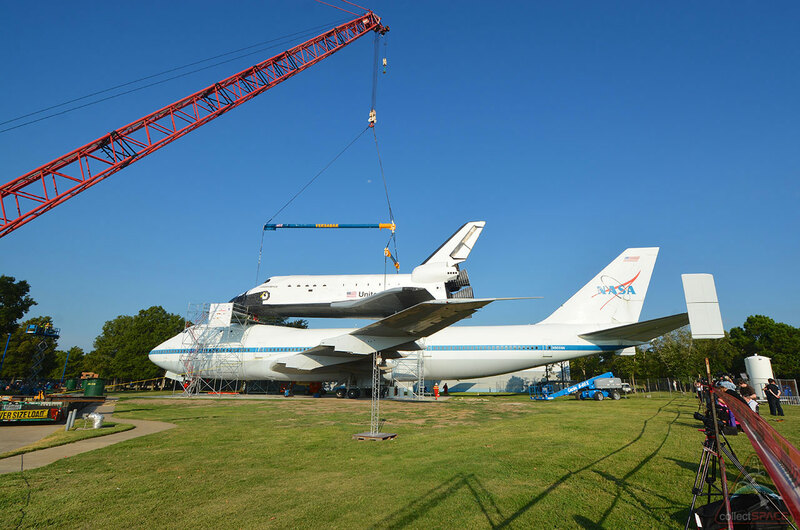 The "Rise of Independence," as the space center dubbed it, took about 30 minutes and employed a 243-foot-tall (74-meter) crane to lift and move the 160,000-pound (72,600-kilogram) shuttle replica onto the SCA. As the sun rose above the shuttle, the center's parking lot was filled with hundreds of spectators, including a number of astronauts and a sizable crowd space program workers with their children. Space Center Houston serves as the visitor center for the nearby NASA Johnson Space Center and Thursday was "Take Your Child to Work" day. "Together, this aircraft and orbiter Independence will make an iconic display that Houston can proudly showcase to the world," former shuttle astronaut Ellen Ochoa, director of Johnson Space Center, said. "This display, I believe, is destined to become the number one Texas attraction." "And it won't be just a display," she added. "I'll be a world-class hands-on education center illustrating Houston's role in human spaceflight." Among the invited guests present and participating in the lift was Tim Judd, the 30-year-old winner of Space Center Houston's state-wide contest to name the replica shuttle. In 2013, Judd was the first out of more than 200 entrants to suggest "Independence." Judd, accompanied musically by the members of the Bay Area Youth Symphony, led the countdown leading to the crane beginning to lift the Independence. The towering crane carefully raised the replica orbiter high off its multi-wheeled transporter and then gently lowered it onto the same attach points that the real space shuttles used to mount onto the aircraft. The mockup was modified to sit at a more level angle than the real orbiters to enable future visitors to safely walk inside. 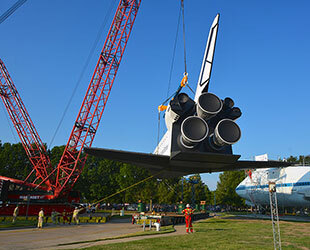 Thursday's lift was the culmination of more than two years of planning, beginning with the arrival of the shuttle replica from Florida, where it had been on display. 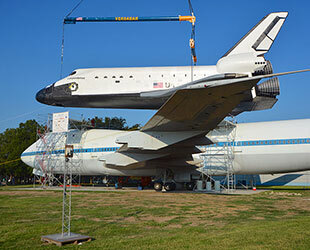 NASA awarded the SCA to Space Center Houston after the aircraft was retired in November 2012. 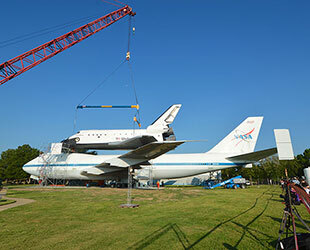 The jet didn't arrive at the space center however, until April of this year after it was partially disassembled for its transport from Ellington Airport eight miles (13 kilometers) away. "This new addition here is larger than life," Eileen Collins, former NASA astronaut and the first woman to command a space shuttle crew, said. "The shuttle carrier aircraft and the Independence are perfect additions to this center." 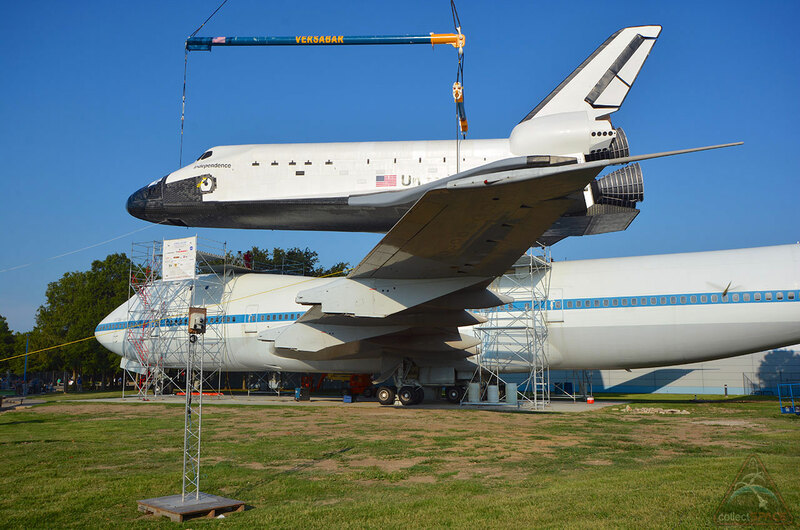 With the Independence now bolted and welded to the back of the aircraft — also known by its tail number, NASA 905 — work will next commence on erecting the access gantry that will allow guests to enter both vehicles. Space Center Houston plans to add exhibits inside the orbiter and jet to help teach the public about the history of the 30-year-long shuttle program. The $12 million project is the largest effort undertaken by the Manned Space Flight Education Foundation, the nonprofit behind Space Center Houston. The organization still needs to raise $2.2 million towards the Shuttle/747 Carrier exhibit. The public can make donations through the Space Center Houston website or texting "Shuttle747" to 41444. Click here for more photos from the Rise of Independence.